Colostrum is the nourishing and life-giving fluid produced by mammals as food for the newborn in the few days after birth, before milk production begins. This unique, bovine-derived food supplement is rich in a variety of biologically active proteins, including immunoglobulins. Source Naturals Bovine Colostrum contains no yeast, egg, gluten, corn, soy or wheat. Contains no salt, preservatives, or artificial color, flavor or fragrance. 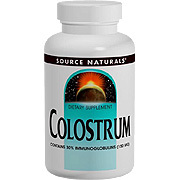 As a dietary supplement, take one Colostrum capsule daily on an empty stomach. Warning: If you are pregnant or breastfeeding, or allergic to cow's milk, consult your health care professional before using Bovine Colostrum product. Standardized Colostrum (dried) 500 mg Yielding 150 mg of naturally occurring immunoglobulins (proteins). Other Ingredients: Gelatin, maltodextrin, and magnesium stearate. 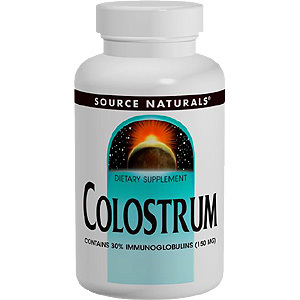 Colostrum 500 mg is shipped in a discrete, unmarked package. Orders are processed immediately and usually take about 3 to 5 working days to be received. We do ask that you try it for 2 to 3 weeks to feel the full effects. Any information received is used only for order processing and shipping purposes. Your information, such as e-mail address, will never be disclosed to a third party.